Home > Forum > Triathlon Forum > 100/100 Runs Challenge: final 3 days...finishing sprint! them on the interweb and call). Did 5 miles today and legs felt like i had on concrete shoes. But they kept wanting to go not go fast but go. Think it is because I did a 45 minutes on the rollers last night beofre putting the kids to bed and then going to bed myself. Come to think of it got to log the roller time in. Oh well...... no time now of to my sons first reconciliation. I'm putting this out there so I don't DNF. Today is a 50k that starts at 3pm. It is a multi loop trail run and will be muddy as hell and frakking cold. I have no idea how I'll do but coach has confidence so I will too. There, now I can't DNF because the shame will be too great. Me personally, I would say the extra 30 secs you ran qualifies your run. Did my first qualifying run for the HTFU challenge this year. I ran on a treadmill and watched Arnold Swartzenegger and a Prehot Alyssa Milano in "Commando" from opening to closing credits. "Don't disturb my friend; he's dead tired." "Let off some steam Bennett!" I feel dirty now. Especially since I bought the movie out of Future Shop's five buck bins. Nice! 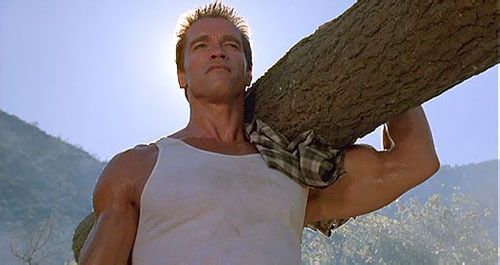 There is something about the classic Arnold flicks that never really get old. No running for me today. I'm ahead of my desired mileage rate (8K per day). Hard ride AM, hard XC ski PM. Hehh....they are in there somewhere! There is no distace requirement. You just have to run. That means taking flight on each stride (both feet leave the ground). The question is "how slow can you do this without doing jumping jacks (illegal...you have to make forward progress and take fight on each stride). Mostly tongue in cheek here, but as a former racewalker, would walking like I did in races count as running? many of us do leave the ground for a fraction of a second at say 20K race pace, it's just not visible to the human eye (which is the criteria in the race walking rules). I say tongue in cheek because obviously I know that any sort of walk shouldn't count because it's contrary to the spirit of the rules. Once you arrive at the race, deposit your excuses in the same location as last night's pasta. speaking of race walking, I was running on the local bikepath this morning, there was a race walker out there who looked pretty serious, he even had a guy on a bike riding along with him and handing him gu and water. not only that, he was going pretty fast too!! !, the upper half of his body looked like he was running, the legs were weird. IRONwolf - whereabouts did you see him? If he was an elite or close to it, there are so few of them, I probably know who he is :) National 50K/World Cup qualifier is in a few weeks so likely it's someone training for that. In the 20K, you wouldn't be likely to be doing a workout where someone handed you Gu and water - possible but not likely. The guy in blue in front is Jefferson Perez, widely considered to have the best technique in the world. These guys are probably going 7:00 pace, but if you watch Perez even in slo-mo, you will not be able to see his feet off the ground. he has to get down closer to 6:00 pace before even stop-video catches him off the ground. I'm back in the game. I ran my first double today. Second one tonight with my son Matt. I love those runs with him. I'm bringing my running stuff with me to work tomorrow. Tell B to watch his back!!!!!!! Makes sense to me! Only 2 miles of racewalking for me since the challenge started, so it won't be an issue. To be fair, they were so covered in mud it was hard to tell were they were! Will someone explain or point to some place where I can read about how the points are calculated for the 100/100. The guy just above me in the spreadsheet has run 2 min less than me, 4.8K more and somehow he almost got twice as many points that I got...why? I know I've seen it explained before (because I asked) but don't have a link. Let me see if I can dig it out. OK, that explains it. Thanks! Interesting, points for weights but not Yoga. Yoga is the hardest workout I do, but yet people wrongly assume its simply stretching. Interesting, points for weights but not childcare. Childcare is the hardest workout I do, but yet people wrongly assume I just plunk them in front of the TV and go make spreadsheets on the computer, drink Scotch and fantasize about ellipitical trainers, yet I get no points. Wah. Wah. So how many aerobic points for x-c skiing?